These pork tenderloin bacon bombs are an offshoot of a prior recipe. 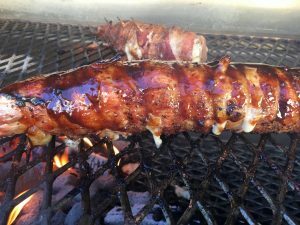 In my last cookbook, Smokin’ Hot in the South, I had a recipe called “smoked chicken bacon bombs. 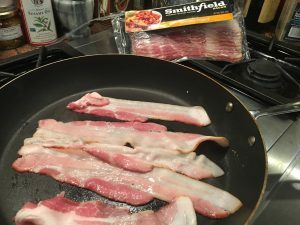 Basically, I am always trying to find ways to make chicken interesting, and adding bacon and some other ingredients seemed the way to go. 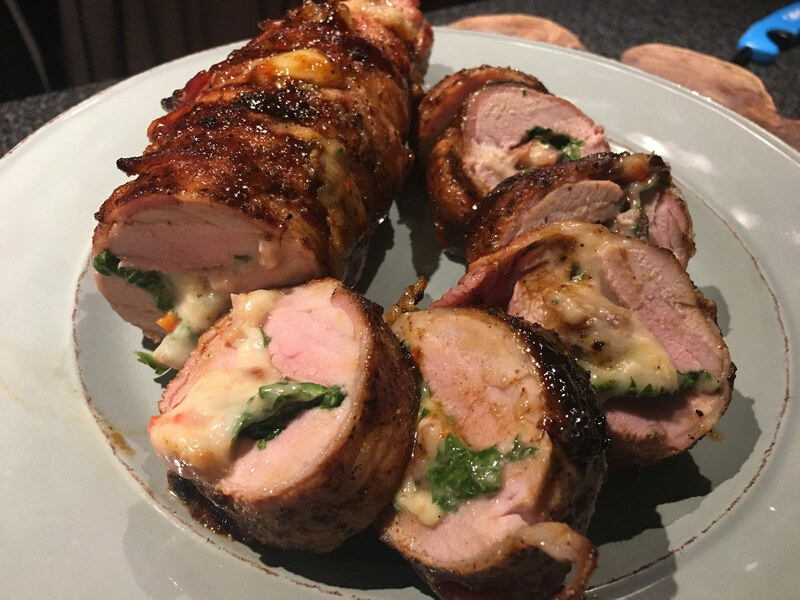 Recently, I’ve been working on some new pork recipes, and decided to adapt that recipe to pork tenderloin. Boy, am I glad I did- they turned out great! These pork tenderloins are literally bursting with flavor, and they work great for an appetizer or as a main entrée, so they’re pretty versatile as well. I have a small infatuation with pink peppercorns, so I made a peppery rub that features them. It really seems to bring out the flavors, especially contrasted against the spinach and mozzarella, which can tend to dull other flavors. 2 1 lb fresh pork tenderloins, preferably Smithfield! Set up a grill for two-zone cooking. 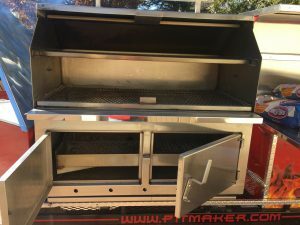 Today I am using my large grill built by Pitmaker in Houston, TX. They really make nice equipment and take a lot of care to ensure the welds, painting etc are done right. 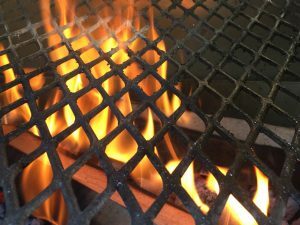 This grill has a moveable charcoal grate so you can raise or lower the heat as needed. 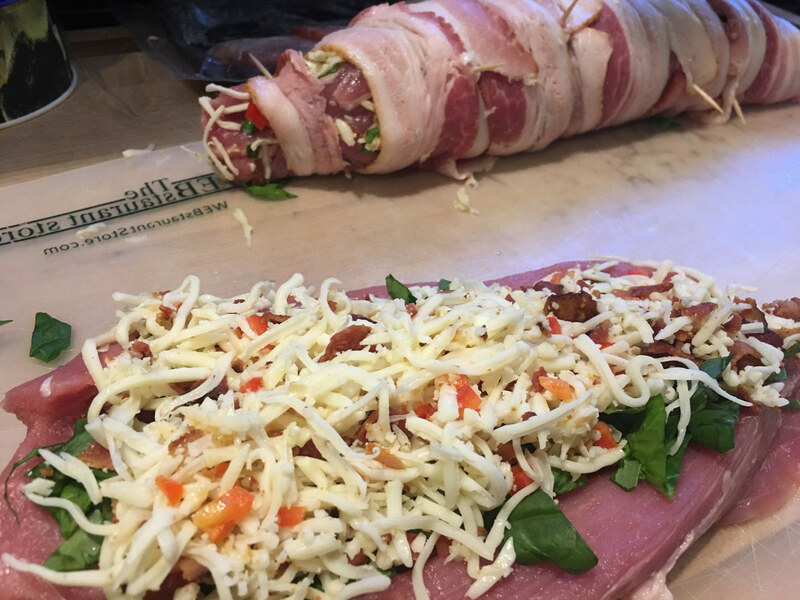 In a mixing bowl, add cheese, chopped bacon, jalapeno, red bell pepper and garlic. Set aside. Take the tenderloins and trim any excess fat and silver skin. 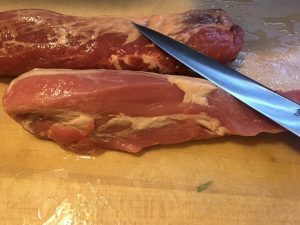 Using a filet knife, slice down the middle of the filet almost through it, then at the base of the slice make additional cuts to make a “t.” Carefully open the cut up and lightly pat the tenderloin to open it up more. The goal here is to make a pocket in the tenderloin all the way from one end to the other. 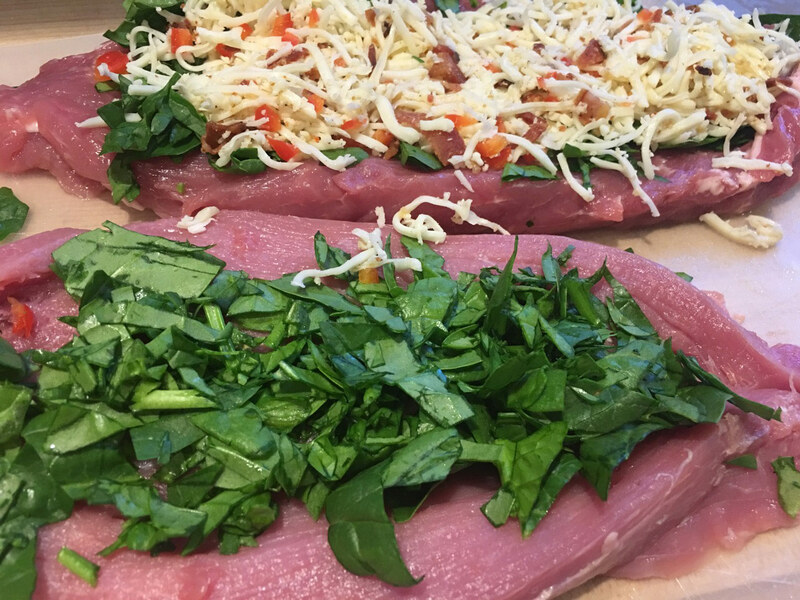 In each tenderloin, place ½ the spinach, then half the cheese mixture, lightly pressing down to fill the tenderloin. 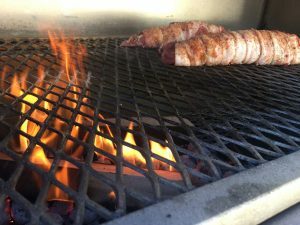 Sprinkle the tenderloin with about 1 tablespoon of the pepper pork rub on each tenderloin, then use the bacon slices to tightly wrap around the tenderloins toothpick to secure. Place on the indirect side of the grill for 20-30 minutes, or until the internal temperature is approaching 125-130. Remove the tenderloins when they hit 145-150 degrees internal temperature. Allow to rest 4-5 minutes. For appetizers, slice into medallions and drizzle with more sauce. 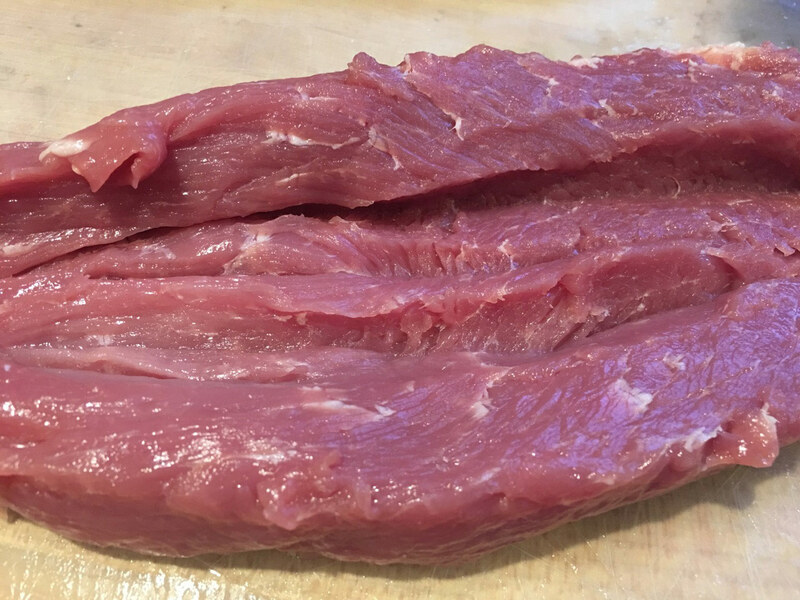 For entrees, simply slice each tenderloin in half to create 4 portions. I’m really pleased with how this came out, and was a big hit with some friends. 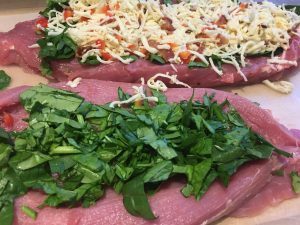 The tenderloins take a bit of prep, but can easily be prepped ahead and then cooked when you need. Don’t stress, just make easy delicious food! Note: I am a paid Ambassador for Smithfield Food. However, all of the opinions contained in my blog are my own, and this post was written voluntarily.